Peter Davison is the Doctor in…The Mutant Phase. Cybermen? Pest control. Sontarans? Cannon fodder. Humans? Cattle. Time Lords? Destined to be defeated. No, what scares the Daleks more than anything is the possibility of becoming something other than a Dalek. Mutation, defects in their genetic code, changes in their DNA strand, the development of positive emotions; all these things will lead to a Dalek willingly submitting themselves to extermination at the hands of their fellow Daleks. The “purity” of the Daleks has always been an underlying theme in their episodes. They are the supreme beings in the universe; any changes that cause deviation from this must be eradicated at all costs. 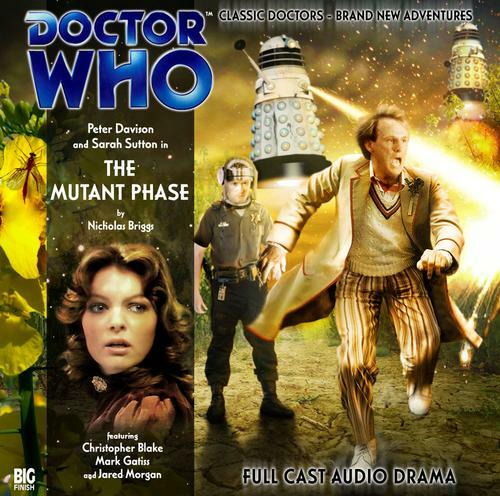 The Mutant Phase is not only the title of this serial, but the name of the change that is being inflicted upon the Daleks; a mutation that causes them to burst from their armored casings as a new type of creature. Nicholas Briggs’ second Big Finish script attempts to weave a tale of time paradoxes and what a species will do to save itself from extinction. For the most part, it succeeds, but in doing so, it flies in the way that Doctor Who avoids meddling with timelines. The Doctor and Nyssa land on 22nd century Earth. An Earth that is currently conquered and ruled by the Daleks, as seen all the way back in the First Doctor serial The Dalek Invasion of Earth. Quickly realizing the danger they are in, the pair quickly retreat into the TARDIS and try to escape, but not before Nyssa is stung by a wasp, receiving a wound that refuses to heal. The Daleks are in hot pursuit, however, and manage to force the TARDIS to land in the 45th century, on a blasted, ruined Earth inhabited by a handful of human survivors and their Thal scientist benefactors. The whole thing, however, turns out a trap by the Daleks; they’ve been tracking the Doctor down because they need his assistance. Skaro is under attack, and will soon be overwhelmed by an alien swarm of insects with metallic wings called the Mutant Phase. The creatures exist on energy, and having drained the universe dry, they have put their home planet under siege. For these insects are a mutated form of Dalek, infected somehow, causing them to grow rapidly, explode from their casings, and begin to attack anything nearby. When even the Thals, the sworn enemies of the Daleks, has allied with them to stop the Mutant Phase, the Doctor knows the situation is serious. The Daleks are evil incarnate, but the Mutant Phase means the end of all life in the cosmos. But in order to defeat them, the Doctor must determine where and when the infection began. And that means directly meddling with established time. Briggs’ first script, The Sirens of Time, was “average” at best. The Mutant Phase shows a bit of improvement. It’s certainly grander in scope, and makes a solid attempt to weave an epic tale from the simplest of ideas; genetic modified wasps and a hole in a Dalek’s casing lead all the way to the Dalek Emperor’s throne room and the fall of Skaro itself. The plot DOES get a little maddening at times; the locations change a good bit, and there’s a scene with human survivors that only serves to show just how much the Daleks mean business. It’s a hell of a story, but sometimes it’s a bit too complex. And it’s REALLY hampered by the climax and the ending, but I’ll touch on that below. It’s no secret that Nyssa has grown on me during my time reviewing Big Finish. Big Finish isn’t afraid to allow the companions of the Doctor to come into their own, and Nyssa is a solid example of this. The audios have really expanded her character and given Sarah Sutton a chance to really shine. The Mutant Phase continues the slow growth that took place over The Land of the Dead and Winter for the Adept. She tends to more along the lines of “ask questions so the Doctor can answer them” this time out, but that’s understandable considering this is the first time Nyssa has encountered the Daleks, as well as asking why the Doctor is trying to change the timeline for the Daleks when he wouldn’t do it for Adric after his end in Earthshock. But she’s also more assertive, albeit it a little prickly, using her scientific background to help the Thals and the Doctor figure out where the mutation entered the Daleks’ gene pool, and even going so far as to making minor repairs to the TARDIS, much to the Doctor’s chagrin. And what of Peter Davison, the young, dashing Doctor who is nonetheless burdened with responsibility and the weight of his years? Here, Davison plays him with the quick, razor-ship mind who still has moments of infallibility. Where Baker and McCoy have their bombastic moments, Davison is more restrained, quietly tip-toeing and playing it coy with Nyssa about time and paradox even as he slowly realizes what has to be done. While I have problems with the way paradoxes are handled in The Mutant Phase, Davison’s portrayal of the Doctor is right on the money. The Daleks, on the verge of genocide, want the Doctor to go back in time and wipe out the Mutant Phase. Two races in the palm of his hand, the devil you know and the devil you won’t. You can hear Davison’s quiet anguish, and when he does raise his voice, it grabs the listener’s attention. Now, it’s not surprise that Briggs is a fanboy. Not only did he pen a Dalek script and direct a Dalek serial, he’s also the voices of the Daleks in this one. All the Daleks. From the wounded Dalek first encountered by the Doctor and Nyssa all the way to the Dalek Emperor himself (a role he would play again in Nine’s final serials, Bad Wolf/The Parting of the Ways). So he put time and effort into the sound for this serial, and it shows. By this point, my default setting for the sound effects by Big Finish is “assume they’re awesome and leave it at that.” The sounds of Dalek-conquered Nebraska, complete with genetically modified wheat stalks and genetically modified wasps, all the way to the fall of Skaro at the hands of the Mutant Phase, all come across clear and at a much better decibel level than The Apocalypse Element assaulted us with. We also have a TARDIS in slow dematerialization and the distant sound of gunfire and grenades punctuating the Doctor’s visit to 22nd century Earth, let alone the horrible sounds of a Mutant Phase ripping through the casing of a Dalek and the sheer panic in its comrades as they fight to survive. Screaming Daleks are normal; panicking Daleks are freaky. Jared Morgan is the standout of the supporting cast, along with Christopher Blake as the Thals who are working with the Daleks to stop the Mutant Phase. The Thals were the original enemies of the Daleks, when they were known as the Kelads and fighting a long war against each other. Blake is the scientist, Ptolem, and he’s the one who’s doing everything he can to actually stop the Mutant Phase, while Morgan is Commander Ganatus and is more concerned with making sure the Daleks don’t find the Thals to be “surplus materials.” You get the conflict and the grim resolution from the two of them as they come off like two long time companions making the best of a horrible situation. And not only that, but the way the Mutant Phase is “solved” hardly makes sense. The initial infection is well-written and easy to follow, but the fix for it is convoluted; in trying to fix the initial problem, the problem is created, but the problem is only created because someone tried to fix the fix, but that someone wasn’t even there the first time, so the situation plays out in a completely different manner…and instead of a time paradox, we just have an alternate timeline vanishing like it never was. Granted, the sound effects of the paradox working itself out are neat, but once it’s all said and done, and the Doctor’s explained what happened; a whole timeline vanished, a race extinguished, and the Daleks still around to spread their evil, he simply throws off a one-liner and grins. Final Synopsis – The Mutant Phase reaches for the brass ring, and comes REALLY close to getting it, thanks to superb performances and an intricate, winding plot. Sadly, the climax is too convoluted, doesn’t make sense, and makes everything that’s happened seem for naught. 3/5. Next up – The Doctor has always admired the work of William Shakespeare. So he is a little surprised that Charley doesn’t hold the galaxy’s greatest playwright in the same esteem. In fact she’s never heard of him. Paul McGann is the Doctor in The Time of the Daleks. This entry was posted in Big Finish Review and tagged Big Finish, Daleks, Doctor Who, Fifth Doctor, Nyssa, Peter Davison, TARDIS. Bookmark the permalink.